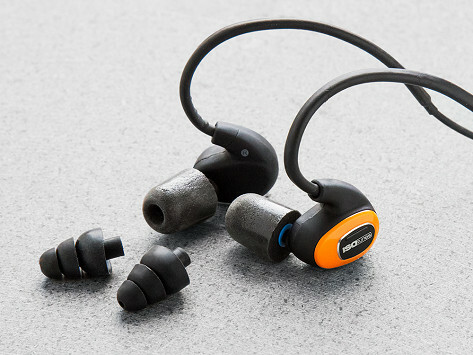 These extra-rugged wired Bluetooth earbuds give you all the benefits of noise-isolating headphones minus the bulk. They’re OSHA compliant and rated as professional-grade. Whether you’re mowing the lawn or on a job site, you’ll be able to tune out the noise and make calls in loud environments. Dimensions: 22" x 1" x 1"
Pros: Excellent sound quality. Comfortable. I can hear clearly even on the noisy streets of NYC. Callers also experience good sound quality. I really like this device but would like when turned on initially to know how charged it is. It does a good job of keeping noise out. Thanks. Very satisfied. The product performs as advertised. Well worth the investment. Sound is outstanding. 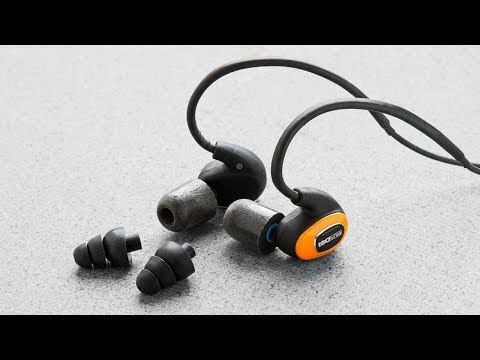 I have had several wireless bluetooth headphones. I listen to audiobooks whenever I'm not working. I take it on walks, drives, in bed, eating lunch. These are very comfortable headphones but that might have more to do with the foam ear pieces than the actual headset itself. For me they sit oddly in the ear but it's not uncomfortable. The semi-rigid wire to curve and retain over the ear is a nice touch. My additional concern is that it has been turning off unexpectedly. I'm not sure what that is about. It is inconsistent so I'll have to see under what circumstances it can be consistently replicated.